A little feedback on the kayak, which I've tried a bit more during the weekend. We went for a little trip in Brevikstr�mmen, through some frozen slush and between ice flakes. I had to be careful because of the canvas, but everything went well. Good conditions, slight breeze and a quiet sea, got a good impression of the kayak. I'd have to say I'm very satisfied. The kayak lives up to every specification. It's easily paddled, easy to manoeuvre, turns when you lean over and goes straight ahead when you want it to. What surprised me the most was the speed, I think it's fast. I'm not an especially good paddler, but a quick spurt left my GPS showing 8.2 knots, and I'm happy with that. Very fine kayak. I look forward to testing it in higher seas. The vacation is over and it was a blast. Excellent weather and conditions, although the wind forced us to stay ashore one day, not that it mattered. We had a great week starting from Hvaler. Evy and I paddled south to Str�mstad and Grebbestad, stopping by Koster�yene on the way home. I have to give you feedback on the kayak. It performed admirably under the whole voyage, and I'm also satisfied with the replaceable keel. 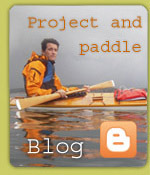 It's fun with a kayak that gets people's attention, and you're known as a kayak builder in Sweden, too. Swedes came running across the rocks to ask who had built the kayak. They obviously recognized the shape, and nodded knowingly when they found out that you had built it. They described the kayak as "j�ttefin". Back to something more practical, the kayak performed extremely well. I sometimes felt a lack of packing space compared to my earlier fibreglass kayak, but I've gotten the hang of it now. I've also confirmed that I don't need to be extraordinarily careful with the canvas skin, it's tougher than you'd think when you hit rocks. And like I mentioned before, the canvas kayak feels special. The smooth way it glides trough the water is even more soothing than a normal kayak. The West Greenland kayak turned out to be a great kayak for long trips. Thanks for preserving old building traditions this way. Am sending you a picture of the kayak and its proud owner.